Populist Party (N.C.). 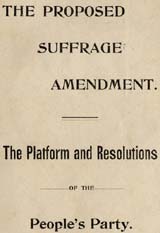 State Executive Committee The Proposed Suffrage Amendment. The Platform and Resolutions of the People's Party. Election law -- North Carolina. Literacy tests (Election law) -- North Carolina. Racism -- Political aspects -- North Carolina. White supremacy movements -- North Carolina -- History. Whites -- Suffrage -- North Carolina.